Parc Aiguebel - An oasis with pool, tennis court and relaxation. 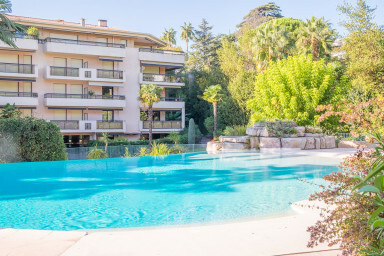 This is a very nice one bedroom apartment in a very well kept residence with park, two lovely swimming pools, and tennis court in a peaceful and quiet part of Cannes. Despite its size, the apartment is spacious, well furnished to a high standard, and offers a balcony with seating for breakfast, lunch or dinner. In the living room you have a comfortable sofa that easily converts to additional bed space and in the bedroom a double bed. The kitchen is well equipped with hob, oven and fridge/freezer, dishwasher, etc. The apartment is air-conditioned and offers free wifi Internet and if you arrive by car, you can either park in the garage or in one of the parking spaces in the yard. The apartment is located in Residence Parc Aiguebel, a secure gated complex with a permanent guardian. Parc Aiguebel is a quiet oasis in the middle of Cannes, a place to relax and recharge. After about a 10 minute walk you are in the center of Cannes and in a few minutes more you reach Boulevard de la Croisette and the beach. There is a bus service from outside the entrance. (Bus line 7).